Emporio Armani Diamonds for Men is designed for the modern man. 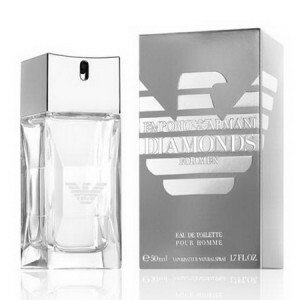 Emporio Armani Diamonds for Men 75ml. EDT is a woody aromatic fragrance containing scents. The top notes are composed of bergamot and wood, and the heart is created of notes of vetiver, cedar and pepper. The base is made ​​of wood, cocoa and amber. In 2008, the perfumer Jacques Cavallier created a new fragrance for men, belongs to a group of tree fern, - Giorgio Armani Emporio Armani Diamonds For Men. This perfume individualist. He will emphasize the philosophical attitude to life, appeal, charisma. The incredible charm of the actor Josh Hartnett has inspired the perfumer to create compositions of Giorgio Armani's Emporio Armani Diamond For Men. Top notes are bergamot and guaiac wood unobtrusively accompany him in the morning. Chinese pepper sichuan, white cedar and vetiver will not get lost in the crowd, even in rush hour. A notes of amber and cocoa throughout the evening will attract the attention of beautiful women. Inconsistent and unpredictable men's fragrance Emporio Armani Diamonds for Men is designed for the modern man who is quite successful and confident. Such men are accustomed to getting everything they just want out of life. This fragrance demonstrates the successful combination of frost chords warmly sensual sound. a perfect, everyday fragrance for mature, successful and confident man. The unique flavor of the game is fascinating contrasts: the traditional men's fragrances woody bouquet perfectly complements mysterious and incredibly passionate blend of pepper and cocoa. Perfume bouquet reveals a refined combination of bergamot and guaiac wood. The heart of the fragrance fascinate notes of vetiver, cedar and Sichuan pepper. Bottom notes of cocoa beans and amber create an extremely pleasant, woody fragrance trail and give it a long-term resistance. The sophistication of this multi-faceted, complex aroma emphasizes rectangular, sleek design of the bottle, designed by Giorgio Armani. A precious fragrance by Armani - the true symbol of courage and passion. Before the man who chooses the Emporio Armani Diamonds, impossible to resist.